Illustration of Quetzalcoatlus northropi by Mark Witton. The second in a series of blog posts by the students of "Bio-aerial Locomotion" at GW, and part of a collaborative and interactive study of some controversial issues about giant pterosaurs' ability to fly. The first student guest blog post (by Akash Druv and Alex Golding) addresses the quadrupedal-launch thesis of Prof. Michael Habib (and colleagues) about how pterosaurs took off from the ground. Although it has detractors, it appears that the quad-launch thesis is accepted by the community of pterosaur scientists. A subject that has caused even more debate in the field is the estimation of weight for these extinct creatures. Pterosaurs (meaning "winged lizard") were flying reptiles which existed from the late Triassic to the end of the Cretaceous period. They are the earliest vertebrates known to have evolved powered flight. Their wings were made up of a membrane, skin and tissue, stretching from their ankles to their fingers. Pterosaurs spanned a wide range of adult sizes, from the smallest Nemicolopterus to the largest known flying creatures of all time, Quetzalcoatlus northropi. Q. northropi had an estimated wingspan of 10-11 m. Due to this vast size and no living specimen, the mass estimates span a wide range. The National History Museum and Henderson (2009) predicted a mass of around 500 kg, whereas Witton more recently suggests a mass of around 250 kg. Yet another mass estimate, from Chatterjee and Templin (2004) placed the giant pterosaur at a wimpy 70 kg. Which one is more likely to be correct? Weight estimations for pterosaurs with incomplete skeletons are quite confusing for non-paleontologists. There is no commonly accepted best way to calculate the weight of an incomplete skeleton. This leads to many competing methodologies, each with its own assumptions and flaws, and therefore many debates on the correct mass of a pterosaur. Even fully accepted parts of the field can seem so bizarre to outsiders that they are too easily dismissed as improbable. How can a creature with a wing span nearly the size of a school bus possibly be in the same weight range as a pony? Fossil records show that the bones of pterosaurs were hollow, similar to birds. These fossils also help us to understand the thickness of the bones. There are fossils with bone thickness as low as 10 mm. Considering the weight of the skeleton with this in mind, estimates of 200-250kg seem reasonable, despite the large size of Q. northropi. University of Portsmouth hollow pterosaur wing bone. The bones have a cross section of a nearly perfect ellipse that increases in size as the pterosaur does. The Relative Failure Force (RFF) of pterosaur bones is 1.9 times the RFF expected of a similarly sized bird. Despite the pterosaur bone layer only being 10-mm thick, it takes twice the force to break its wings as it would for a bird. This makes a pterosaur skeleton not only incredibly lightweight, but also more than up to the task of supporting the wing loading of such a large creature. 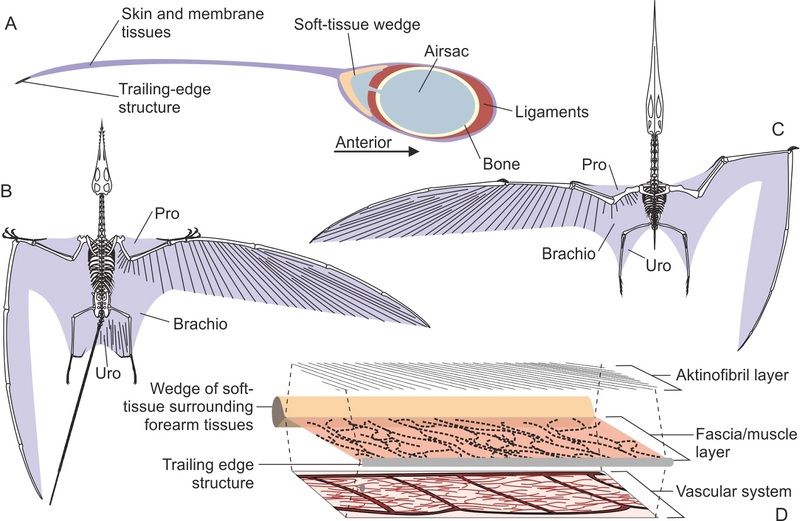 The flight membrane of a pterosaur is also constructed for lightweight strength. Unlike flimsy bat membranes, radiating out from a pterosaur’s arms are small stiff keratin rods called actinofilbrils. These fibers are .05 mm in diameter and are evenly spaced 0.2 mm apart throughout the membrane. Actinofilbrils run perpendicular to the arms and hands then slowly shift until they are nearly parallel to the fingers. This prevents the pterosaur wings from billowing and flapping while still being very lightweight, allowing pterosaurs to reach sizes well above those possible for bats. With their understanding of pterosaur biology, paleontologists can estimate the weight of a pterosaur from its full skeleton quite accurately, but things are much harder when the scientists only have partial skeletons to work from. There are several different methods used for estimating the weight of a pterosaur from partial remains. Using pterosaurs where both the body dimensions and probable mass are already known, a regression analysis can be developed using a specific known dimension (for example, body length) and mass. For unknown pterosaurs close in size to many known pterosaurs, this methodology can be accurate enough. If the pterosaur is much larger than any fully known pterosaur, like in the case of Q. northropi, the results of such an analysis can be highly inaccurate, up to three times larger than even the largest estimate. Another methodology is to select a single fully known pterosaur that is closely related to the unknown pterosaur and simply scale up the fully known one. The results of this method are inaccurate but they do lie in the range of the correct mass, making it a good simple way to check if more complicated methods are yielding probable results. This method will not work if the fully known pterosaur is not closely related to the unknown one. In a mathematical methodology called slicing, a model of the unknown pterosaur is sliced up into chunks. Each chunk is assigned its own density based upon observations of density in other pterosaurs and similar animals. The mass is then calculated from the volume multiplied by the density. Proven to be accurate in predicting the mass of different species of birds, it is nevertheless contingent upon having an accurate model of the pterosaur. Overestimating the length of the pterosaur, for example, can result in as much as a doubling of the mass. How heavy was Quetzalcoatlus northropi? One important thing to note is that all these methodologies require accurate models of the shape and size of the unknown pterosaur. In the real world, such estimations are sometimes very hard to come by. In 2009, Donald Henderson attempted to model Q. northropi using the mathematical slicing methodology. Instead of making his own estimations of body type and size, Henderson used estimations made by Wellnhofer and Langston, predicting a wingspan of 11.2 m and a torso length of 1.8 m. His result was a weight of 544 kg —much too heavy for Q. northropi to have possessed the capability of active flight. The next year, Witton & Habib published a paper on the ability of Q. northropi to fly. According to them, a much better estimate for torso length would be .67 m, which would have reduced its weight to 240 kg. Unfortunately for both Henderson and any untrained observers, Witton & Habib based this new estimates on unpublished data by Habib and personal communications with Langston. Witton & Habib provide no data or explanation on why the new estimate of torso length is better than the old one, except to say that it is consistent with the proportions of the smaller specimens called Quetzalcoaltus sp. He estimates a weight of 544 kg, which would make Q. northropi incapable of flight. The weight of the Q. northropi model can be reduced to 198 kg, but the resulting model neither has the internal space for the lungs and other organs, nor sufficient musculature to enable takeoff and active flight. The body width and depth is reduced by 20% and 25% respectively from the model used for the rest of the calculations. There is a notable gap between the weight of Q. northropi and the other "giant" pterosaurs, like Tupuxuara. Tupuxuara weighs in at 22.8 kg, nearly half the weight of the largest flying modern birds at 41 kg. This gap mirrors the gap between the weights of modern flightless birds and their flying counterparts. It is also of note that it took approximately 80 million years for birds to go from flying to flightless, while the Q. northropi would have had 160 million years to develop flightlessness. Wing span is extremely important—a pterosaur with a 13-m wingspan would have twice the mass of a pterosaur with a 10-meter wingspan. Witton & Habib suggest that overestimation of wingspan is in large part responsible for what he considers an overestimation of weight. Q. northropi is a member of the Azhdarchid family of pterosaurs. While Tupuxuara is closely related to the Azhdarchid family, there are key differences in the head and neck area that would cause an overestimation of weight it it were scaled to Q. northropi size. Of note in the argument about using birds to make predictions for pterosaurs—bird bones grow more slender as the bird increases in size, so that bird wings would snap after a certain span, limiting their flying size. Pterosaurs show the opposite: their bones increase in diameter as they grow larger, which allows them to have much larger wingspans without fear of damage. "Hollow Pterosaur Wing-bone." Palaeobiology. University of Portsmouth, n.d. Web. 25 Nov. 2013. Witton, Mark P. "Quetzalcoatlus Northropi (again)." Flickr. Yahoo!, 17 Nov. 2006. Web. 25 Nov. 2013. Witton, Mark P. Pterosaurs. Natural History, Evolution, Anatomy. Princeton: Princeton Univ. Press, 2013.
where is the lift force, is the lift coefficient, is the air density, the flight speed and the wing surface area. Assuming an air density of 1.25 kg/m3, a lift coefficient of 0.6 (standard for birds), and a modeled wing surface area of 11.36 m2, the lift force and cruising speed are the only remaining variables. In order to estimate the weight, the concept of wing loading, a ratio of weight to wing surface area, is utilized. According to the Great Flight Diagram (Tennekes, 2009), other pterosaurs of comparable size would require a wing loading of approximately 220 kg/m2. This yields a weight of about 2500 N. Dividing this weight by the acceleration of gravity yields an approximate mass of 250 kg. From here, the cruising speed can also be estimated. According to Witton and Habib (2010), these estimates are in line with those of Paul Henderson (using an updated model). Use of this method brings up a few issues with regard to validity, such as assuming flight, making assumptions about the anatomy of an extinct species very little is known about, and the effect of other assumptions made during the calculations. Also, it has been noted that basing all anatomy assumptions on the anatomies of modern birds can be misleading, as pterosaurs seem to be a very unique family of species. Finally, the assumptions made during calculations could have a significant effect on their outcome. Anatomical assumptions, such as wing shape, wing span, skeletal density, and overall average density must be made (or obtained from ever-changing models). In the estimates made by Henderson (2010), different densities were used for different parts of the body, and all were based on (reasonable) assumptions. The wide range of possibilities in these assumptions make this a very tricky path to navigate. It seems all methods of mass estimation have this problem, though, as is demonstrated by the fairly large standard deviations in all of the papers we have read on the subject. In conclusion, Mr. Cunningham’s method does seem to provide results that agree with the prevailing mass estimates for Q.n. However, due to the number of assumptions made, this method is best used as validation for models and estimates created from fossils, and should not be used as “evidence” for flight ability. However, as this method is developed further, it should make an excellent tool for checking results when estimating mass for extinct avian species. Hank Tennekes. The Simple Science of Flight, Second Edition, MIT Press, 2009. Good stuff! I really enjoyed reading through that and I think you've done a good job discussing some of the different methods available to palaeontologists in order to estimate mass. I also enjoyed the reverse mass estimation section as I had heard of that before, but never actually seen it written out. Can I ask where you got that information from? I did just want to point out something about mass estimation methods. I'm not sure if you saw this one or not, but one of the most cited papers on mass estimation in pterosaurs is probably that of Mark Witton's 2008 paper (which is cited under the reverse estimation method). It is similar to what you mention as a regression method, but he used the relationship seen in birds between skeletal mass and total mass as a predictor for pterosaurs. The brilliance of this method is that you don't need a complete skeleton, but just an idea of the bone size and shape to model for mass. However, as you mention in the post, that means a direct comparison with birds, which may not be the best analogues. One other quick point. This may have just been a typo, but pterosaur wing bones are often less than a mm thick, with average being probably 1-1.5 mm. And these are bones that 60 cm long, not tiny ones. The amount of force they can withstand is phenomenal considering they have such little bone material! These animals were doing so many things that nothing today is capable of, and they are so awesome! We're still far from finishing this argument on pterosaur mass, and there are a couple of people actively working on it (me included). It does seem interesting that the estimates of 200-250 kg keep popping up for Q. northropi using different methods... I think we're getting closer! Thanks so much for your comment, Liz! I realize that you are doing your PhD at Southampton precisely on the topic of mass estimation of pterosaurs, and that your supervisor is Dr. Gareth Dyke. We read the paper by Palmer & Dyke (2012) that looked for wing shapes that would have better aerodynamic characteristics. They conclude that forward sweep was advantageous for passive stability. But they used the Henderson (2010) mass estimate in their analysis. Do you know why? Witton and Habib's PLOS One paper was already out—and they established that Henderson's 544-kg estimate was based on an incorrect body length. Do you know how the analysis of wing shape would be affected by reducing the mass by half? Hello Lorena and students, Colin Palmer here, the lead author on the paper you mention above. I am also one of Liz's supervisors and have a few thoughts on the mass assessment guest blog, so hope it is OK if I put the whole lot together. On mass estimation. In fact no pterosaurs can be “fully known” in that we actually know little about soft tissue, so the whole process has to be based either on what we do know (the skeleton) or estimates of what might have been - building up a model of the body taking account of the necessary muscles, digestive systems and respiratory systems. In connection with the latter, it seems likely that pterosaurs had an air sack system like birds, which means that they required relatively smaller lung volumes since the lungs of birds (with an air sack respiratory system) are more efficient than those of mammals for example. The CL method can give almost any answer you want. Suppose I say that the operating CL is 1.0 (quite plausible for a cambered flexible membrane) and the area is underestimated by about 10%. A speed of 20m/s allows a weight of 3000N, increasing to 4690 at 25 m/s. These flight speeds are comparable to those of albatrosses, so seem reasonable. So the question from this perspective comes down to how could they take off and land. I think the quadrapedal launch hypothesis goes a long way to answering the take-off question, but if they flew at 20m/s, how did they land without breaking their bones on impact? It seems unlikely that they used water as swans do. On the wings of pterosaurs. You correctly note that the wing membrane appears to have contained a network of fibres, which were most likely made from a higher modulus material than the surrounding membrane. However, being very thin, what mechanism do you envisage such that they were able to stop the wing from flapping? They would have had very little out of plane stiffness. Now on to wing shapes. The analysis I did was for generalised 6-7m wingspan species, a size for which we have complete skeletons. I used Bramwell & Whitfield to give a low end weight estimate and Henderson to give a high end (but noting that at this size the difference between Henderson and Witton is not particularly large, so saw no reason to include the Witton estimate as well.) I also used B&W’s and Henderson’s methods because they provided a information on the mass of different parts of the body and/or an estimate of centre of mass location. Witton does not do this, and cannot by the very nature of his methodology. I also included the Strang estimate as it gave a higher wing mass proportion than the others, and I wanted to be able to bracket the range of possible answers. As you can see from Figure 3 in the paper, all three approaches gave broadly similar amounts of forward sweep (600 to 800mm) being required for CM and CP to be coincident. In all cases much more than the great majority of reconstructions. The analysis of wing shape used an inviscid potential flow code so providing that there is no flow separation, the results will be independent of wing loading and thus estimated weight. The proposal about the effects of flexibility on stability were tentative and would require more comprehensive dynamic modelling to be sure. Huge thanks for dropping into this conversation with your comments, Colin. I'm also curious if the propatagium, providing a sharp leading edge, could often induce separation. For the smaller pterosaurs, maybe there is even scope for a laminar separation bubble / leading-edge vortex in that case? (leading to enhanced lift, perhaps?). Indeed, they were simple steady state analyses, but relevant for soaring flight, which is a behaviour we think was common for these animals. The way XFLR works is that you can base it on specific aerofoils - XFOIL is embedded as a front end. This means it is OK at Re < 10^6 (typical Re for a pterosaur wing is around 500,000 at mid span). For flapping you may know Strang's paper and as I guess you know there is masses of work around on the flapping of flexible wings (some of which uses the public domain ASWING (http://web.mit.edu/drela/Public/web/aswing/). However, transient effects when landing could be interesting as I think landing is the one thing for which we do not, as yet, have a real answer. I think part of the trick was that pterosaurs, unlike birds, were able to make substantial changes to their wing camber and thus achieve very high CL (along with high drag, but that is OK when you are landing.) I alluded to that in my 2010 paper. Additional lift from transient effects would have helped too. Interesting thoughts about the propatagium. Simple answer is that I don't know. For sure, a sharp leading edge is less tolerant of variation in angle of attack, but as it could be "drooped" a bit by depressing the pteroid, it could have been a camber inducing as well. Takeoff, however, is a whole different matter and `i would suggest that this: " is the one thing for which we do not, as yet, have a real answer." I am sure that you are right in that the technique you describes not only increases drag but also causes a transient increase in lift coefficient. Birds use the technique and as a paraglider pilot, I like you have used it too. That said, I don't think it works for large aircraft, so there is presumably some sort of scale effect at work. That is the area that I think should be investigated - perhaps a project for one of Lorena's students. Thank you for your comments. The so-called snap-stall for landing works well for hang-gliders simply because their undercarriage is two human legs. I have flown hang-gliders with wheels in the early days of winch-launching and you cannot snap-stall onto an un-sprung A frame without breaking something. I can't see any reason why Q.n could not perform a snap stall as a routine method of landing, even though it appears to have rather skimpy rear limbs. In 1991 when I was trying to get a foot-launched powered hang-glider through the then BCAR Section S, I had to demonstrate that my 'undercarriage' was sufficiently robust to meet the spec. The CAA made me wear the wing/power unit and then jump off a chair! Since then of course, microlights have really come into their own, but the problem I faced was not the strength in my legs - in real landings most of the load was being released gradually as the wing stalled and acted like a parachute. The technique was to maintain balance through the few steps it took to finish the 'landing roll'. I know this sounds bizarre, but it is on record with the CAA. (G-MWOT if you want to look it up}. So I would suggest that landing is not a problem for the large azhdarchids and we can perhaps move that part of its flight envelope from hypothesis into theory? By increasing order of difficulty, it is steady gliding flight; then steady flapping flight; and finally takeoff/climb which appear to present the most challenging problems. To start with, for steady gliding flight, we need to settle on the basics such as weight, CG position, CL position, wing planform and wing section. I notice from your paper that you did experiments with various wing sections, but I couldn't find their coordinates. They look like Eppler 376 to 379 sections, which depict a mostly single surface wing. If I were to build a model Q.n, what wing section would you recommend?